I was surprised by his comment that the trend in real GDP is only 1.75%. That certainly is at odds with the predictions of President Donald Trump and his supply-side advisers, who believe that their policies will boost real GDP growth up to the old normal of 3.0% and even 4.0%. I have been expecting more of the same, i.e., 2.0%-2.5%. (2) Productivity growth. The article is much more pessimistic (or perhaps realistic) about the outlook for productivity growth than are today’s supply-siders. Fernald concedes: “The major source of uncertainty about the future concerns productivity growth rather than demographics. Historically, changes in trend productivity growth have been unpredictable and large.” Nevertheless, he estimates that the new normal trend growth rate in real GDP is 1.6%, implying that productivity won’t grow much faster than 1.0%. 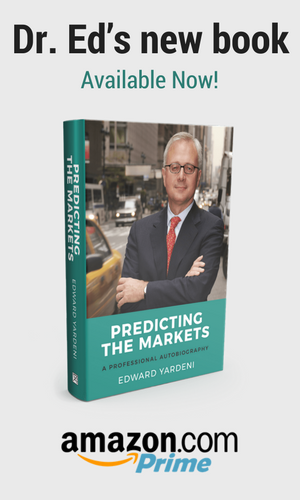 For more on technology and productivity, see Chapter 3 of my new book, Predicting the Markets: A Professional Autobiography.